Lenses :: CSC/Mirrorless :: LUMIX G :: Panasonic LUMIX G 45-175mm X POWER O.I.S. Home/Lenses/CSC/Mirrorless/LUMIX G/Panasonic LUMIX G 45-175mm X POWER O.I.S. Panasonic LUMIX G 45-175mm X POWER O.I.S. The industry’s first adoption of Multi-Actuator Floating Inner Focus System* which controls 3 lens groups separately by the individual actuator achieves downsizing in both size and weight. 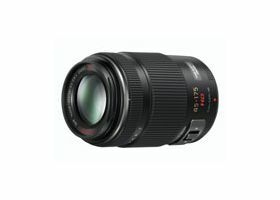 It also achieves high descriptive performance for resolution and contrast at entire zoom range 45-175mm (35mm camera equivalent: 90-350mm) without changing the overall length.In addition, the lens system features the inclusion of 2 ED lenses, which suppress chromatic aberration, contributing to high descriptive performance at entire zoom range. * For a digital interchangeable lens as of August 26, 2011./ ** The time for focusing on the subject is measured with the DMC-GF3 to move the lens position to ""2m"" from ""infinity"" position at wide-end. Panasonic measurement method. ****/ *** Measured with DMC-GF3. The time required to start exposure after the shutter button is fully pressed after the lens position is moved from “infinity” to “2m” at wide-end. ****/ **** The firmware of the GF3 must be updated to Ver.1.1 or later. Panasonic measurement method.